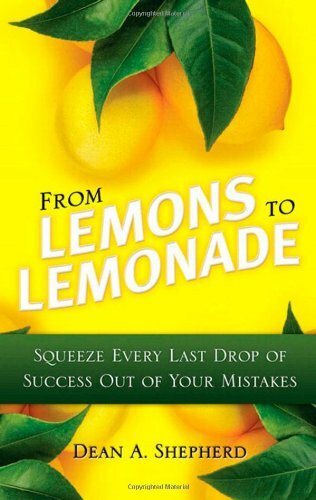 Order ‘From Lemons to Lemonade: Squeeze Every Last Drop of Success Out of Your Mistakes’ by Dean A. Shepherd, available from Amazon.com by clicking on the book cover above! Failure is epidemic in America these days, some of it earned, much of it dropped in the laps of hard-working entrepreneurs who did nothing wrong but have still seen their life work vanish in recent months. But when Dean Shepherd, the Randall L. Tobias Chair in Entrepreneurial Leadership at Indiana University’s Kelley School of Business, sees failure, he smells opportunity. He’s the author of a new book called From Lemons to Lemonade: Squeeze Every Last Drop of Success Out of Your Mistakes. For my part, I’m hoping this interview is more lemonade than lemons.